With 16 needles, speeds of up to 1,400 stitches per minute (spm), automatic tension settings, and a narrow cylindrical arm—the BERNINA E 16 will complete the task like a pro—whether embroidering a jacket back or small pocket. Personalize team uniforms and caps, monogram stylish totes, commemorate a special occasion, use the Chenille technique for a special 3-D effect, or complete an elaborate embroidered quilt—the results will be everything you ever dreamed of. With roots in the industrial world, BERNINA is excited to share with you the dream of faster, more professional and larger embroidery than ever before. The dream of 16-needle embroidery suitable for home, studio, or commercial use is now a reality. Whether you’re new to machine embroidery or more experienced, you will appreciate the thought behind the details. Complete more embroidery more quickly by eliminating the time spent re-threading for each color change. Less time spent managing the embroidery process means more time for creativity and more custom jobs completed. Complete more embroidery projects confidently and more successfully with 1,400 spm and the quality of a true commercial system. From jacket backs to embroidered quilt blocks, your BERNINA E 16 will handle large projects with ease. Speed, precision, and a high-performance thread trimmer are the benefits of the BERNINA rotary hook system. Compatible with convenient pre-wound bobbins for even more time saving. This unique system ensures threads are fed smoothly and with automatic tension adjustments, for the same perfect quality on every sew-out. Embroider confidently, knowing each stitch-out will be as beautiful as you envision. 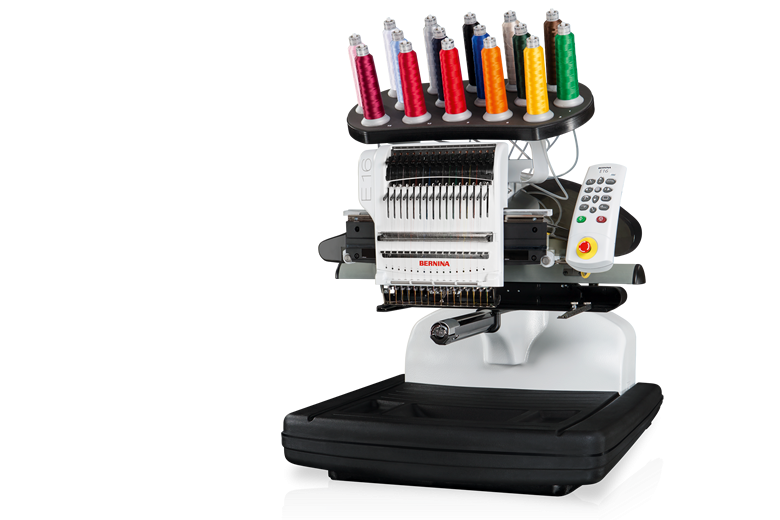 Your BERNINA E 16 handles all of your embroidery needs, large and small. Slide baby items, T-shirts, pockets, or tote bags easily over the narrow arm, eliminating the need to open seams or deconstruct the item prior to embroidering. The ultraprecise laser registration assures accurate design placement. Your BERNINA E 16 includes an assortment of standard accessories and time-saving features. When your creativity or growing business is ready for more, the Go Pro system has you covered. With the optional cap driver and wide frame, customizing caps is a breeze, whether you need one or twenty. The narrow cylindrical arm combined with the unique pocket frames are perfect for stitching in tight spaces. Discover unlimited embroidery possibilities with the addition of BERNINA Embroidery Software 7. Create custom monograms, edit existing designs, or digitize your own designs.